Prior to being awarded the contract, and throughout the execution of the project, Procter Automatic Gates worked closely with the head teacher, architects (Studio E), design consultants (FoRm Associates Ltd) and contractor (Willmott Dixon Construction Ltd). Procter’s experts provided advice in relation to perimeter security, the specification of gates and fencing, the safety of powered gates, and access controls. Indeed, the company’s ability to provide a comprehensive service that included advice as well as design, manufacture and installation was one of the reasons why the contract was awarded to Procter, with competitive pricing and high quality being two further reasons. 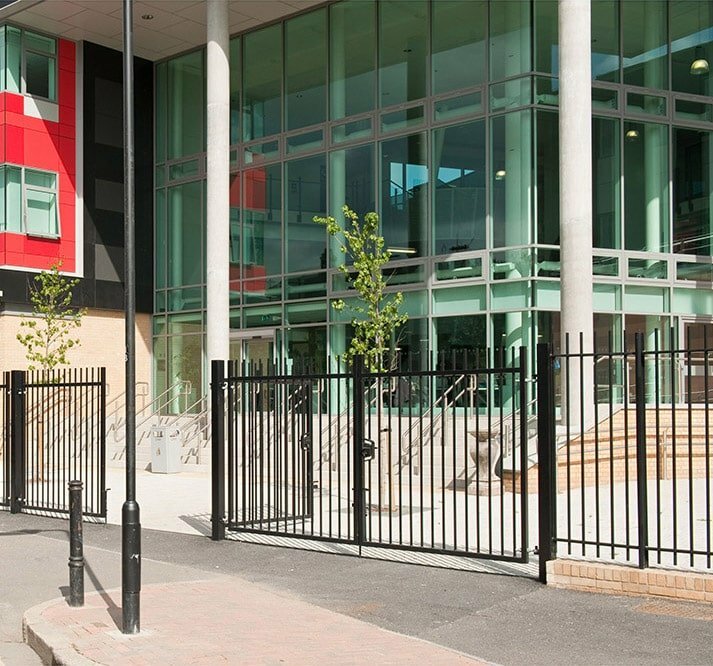 Procter Contracts has designed, manufactured and installed gates and fences at the Skinners’ Academy, a secondary school in Hackney sponsored by the Skinners’ Company and specialising in Business, Enterprise and ICT. The new facilities were procured under the PfS (Partnerships for Schools) Framework, with the total value of the project being £26 Million. The automated gates for the school entrances are both cantilevered sliding gates that control access through 8m-wide openings. These are Procter Pro-glide 20 gates that have been customised with laser-cut panels containing the academy’s name in its own colours. In addition, the gates feature the architect’s choice of round pales to compliment the ornamental vertical bar railings either side of the entrances. Procter Pro-glide automated gates can be installed and commissioned in just one day, with each gate being lifted directly into position using the crane mounted on the delivery lorry. After that, each gate was issued with a Declaration of Conformity and CE marked in accordance with the Machinery Directive. Procter Contracts also supplied and installed railings, security mesh panel fencing and additional swing gates, of which there were two powered and four manual. In total there was 300m of boundary fencing, comprising ornamental railings along the roadside boundary and high-security mesh panel Pro-sure 358 fencing to provide anti-climb and anti-cut protection at the rear of the site. Everything was installed by Procter’s own teams, with no use of subcontractors, to ensure the high-quality fencing and gates were not compromised by the substandard installation. The two powered sliding gates were also integrated with the academy’s access control system. 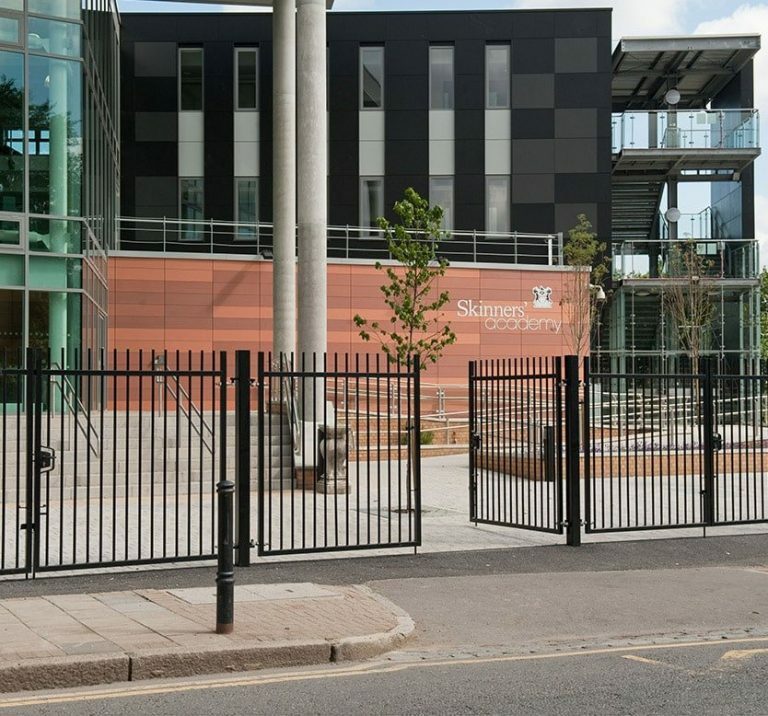 The Skinners’ Academy customer case study illustrates well how Procter can take on projects requiring a combination of automated gates, manually operated gates, ornamental railings and high-security fencing, providing a comprehensive service covering consultancy, design, manufacture and installation.